Click here to check out more Sky Watch participants or to join in on the fun yourself. such a dreamy image. beautiful hues on this wonderful sunset. I love the different layers of color in that sunset. Beautiful photo. I love sunsets too, can't get enough of them. fantastic colors it is beautiful there! Gorgeous, gorgeous, gorgeous. I love the clouds and the colors and the tree. You just keep on taking sunset pictures. I love that tree silhouetted against the sky. Sunsets AND dogs? Surely not, just doesn't make sense :-) Your shot is gorgeous - love the silouette of the tree. Beautiful colors! This is one of the greatest sunsets I've ever seen. Well Misty, you just keep recording them and I'll keep going YES! You KNOW I am a sucker for a sunset! Great shot. great capture! I love that wonderful colors of the sky!!!! I can see why you are breathless over this. The colours are absolutely beautiful. This one is fabulous. I can almost feel what the air would be like sitting on a porch watching this beautiful drama unfold. I'd be obsessed to. Out of the world image. Told you Misty, you always produce a fantastic shot. 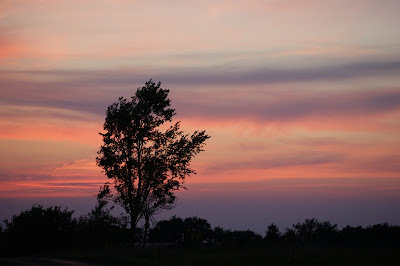 Misty: What a marvelous sunset with those great colors around the tree. Simply stunning … takes my breath away! My Sky Watch is of BLUE SKIES in So Cal … at Sacred Ruminations. you are right, it's an awsome image! We don't WANT you to stop taking pictures like this gorgeous one! Love and hugs and stuff! That is absolutely gorgeous ! I love the layers of colour here! I don't see how anyone could ever get sick of sunsets like that one - just beautiful! I think I remember you using the same vantage point with the tree before, but the sky is so different this time with those broad brush strokes of colour across it. Just lovely. Just beautiful -- you're within your rights to be obsessed. Simply beautiful view of the horizon for sky watch friday, thanks for sharing. I too am a sunset person! This photo is gorgeous! The pinks and purples are just stunning! I don't think you can ever have too many sunset photos! Great job!